"What I have in mind, Bob, is the possibility of a network of regular telephone line RTTY for deaf people who can afford one. . . . but not to lease one via the telephone company nor a special telephone line . . . why won't it be possible to translate over the regular line by proper modification of equipment . . . What do you think?" A physicist, an orthodontist, and an engineer: three deaf men, practically strangers to one another, would in 1964 embark on a journey that would change the lives of all deaf people forever. Robert H. Weitbrecht, an accomplished physicist, had been working for years on developing portable devices that deaf people could use in lieu of, and in conjunction with, telephones. James C. Marsters was a successful dentist who had already clashed once with the telecommunications company over connecting his own modified telephone and was eager to take the next step. Andrew Saks, himself an engineer with his own homemade inventions, had the business acumen to make Marsters' dream of easy and affordable communication a reality and put one of Weitbrecht's machines in every deaf person's home. 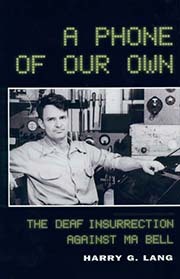 Harry G. Lang tells the remarkable story of the trio's twenty year battle with AT&T and the federal government to efficiently produce, distribute, and connect teletypewriters in A Phone of Our Own: The Deaf Insurrection Against Ma Bell. It was not, however, exclusively the efforts of these three extraordinary individuals that resulted in the widespread use of TTYs. As Lang painstakingly demonstrates, a coordinated effort spanning the entire deaf community induced AT&T's acquiescence and the federal government's insurance of a national relay system and the affordable distribution of TTYs. Read here the first chapter of Lang's story, A Chance Encounter, and learn how Weitbrecht, Marsters, and Saks first met and began their odyssey, or order A Phone of Our Own now at your special discounted rate. The Press published two of its Spring books last month, Editor Cynthia B. Roy's Innovative Practices for Teaching Sign Language Interpreters and Alison Callaway's Deaf Children in China. Read an excerpt of Chapter One: Teaching Interpreting - Past, Present, and Future from the former or an excerpt of Chapter Six: Letters to Zhou Hong from the latter. CHOICE magazine offers a ringing endorsement of Robert M. Buchanan's Illusions of Equality: Deaf Americans in School and Factory, 1850-1950 in its March 15 issue: "Buchanan thoughtfully explores the plight of deaf Americans, a group generally ignored even in studies of social movements." Read this review, or read an excerpt from Chapter Six.